These refrigerators feature white steel door panels‚ rustproof shelving and gasketed magnetic doors. Model 05LREETSA is an undercounter refrigerator with a reversible door. 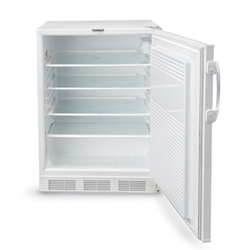 This three-shelf manual-defrost unit is perfect for use as an economical BOD incubator alternative with our BOD refrigerator converter (stock # 63390)‚ which provides thermostatically controlled constant temperature heating and/or refrigeration as required.